After experiencing the convenience, simplicity and safety of a Coleman dual-fuel lantern, I really do not understand why they are not more popular. The true camping diehards know a good thing though, and you often see dual-fuel gear in their camping kits. In January 2011, some of our camping gear was damaged in the Queensland floods. Unfortunately, our LPG gas bottles, lanterns and stove all got submerged. While I could possibly have cleaned them off, the regular gas explosions that are reported in the media made me consider other options. It seems nearly every month there is an incident where a BBQ gas bottle, camping gas bottle, or gas fitted in homes explodes with disastrous consequences. Recently even a Brisbane City Council gas-powered bus exploded! We have also had our own issues with gas, including inadvertently leaking half a bottle of gas over a couple of days on a camping trip. We only realised when the people sitting around their camp fire downwind of us mentioned that they could smell gas!! Apart from the safety issue, LPG gas also has a few other draw backs. Firstly, not knowing exactly how much is left in a gas bottle. I know that there are ways of estimating how much gas is left in a bottle, but it is just not the same as visually sighting how much is left in the tank. That then brings me to the second major drawback of gas. You generally run a gas bottle until it is empty and then refill it. What happens if you have a half empty gas bottle before going away camping? Do you refill the half empty bottle, or risk running out of gas on the trip? That leads many people to carry two gas bottles with them when travelling, allowing them to completely use one bottle, then switching to the other bottle so that the first bottle can be refilled. Gas bottles are bulky and require care and ventilation when transporting them, so having to carry one, let alone two, is not an ideal situation. My research showed that alternatives to gas included methylated spirit stoves and kerosene lanterns. However, I wanted to only carry one fuel for both cooking and lighting, and it seemed almost impossible to get a lantern and stove to run on the same fuel. Dual fuel lanterns and stoves therefore topped the list. After reviewing material on the web, including YouTube and reviews, I thought I would purchase a small dual-fuel lantern to trial. The Coleman Premium two-mantle, dual-fuel lantern (model 285) came well packed with foam padding around the globe (nothing broken despite being sent through Australia Post), two mantles and a filter funnel for refuelling. 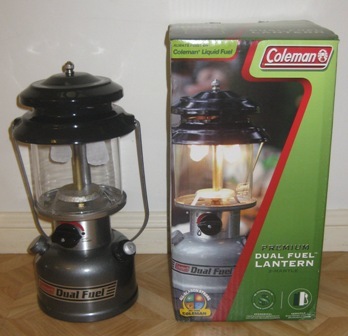 It seems from the Coleman Australia web site that they may not be continuing to import the lantern model that I have purchased as only the Northstar models are still listed – please correct me if I am wrong. After fitting the mantles (Coleman #21) and burning them off, filling up the fuel tank and pressurising it, I then lit a match and turned the lantern on. The lantern took a few moments to light (presumably because the fuel had to make its way through the empty fuel lines) and then gave a really nice, white light. The lantern manual recommends either Coleman fuel or unleaded gasoline. I tried to find some Coleman fuel in my local camping stores, but none stock it. I am therefore using Shellite as a fuel. I find liquid fuel stored in bottles very convenient to use and easy to recognise when you are running low on fuel. If I get really desperate, I can also run the gear on unleaded petrol which is readily available and cheap. Being able to share the fuel between a stove and lantern also means that I am not carrying multiple types of flammable liquid while travelling. I have played around with the lantern lighting technique and discovered that it pays to follow the instructions! If you only turn on the fuel valve a little bit, or turn on the fuel before inserting the lit match, you are likely to get a flare up of unburnt fuel. By inserting the lit match and then turning the fuel valve immediately to high, it minimises the time taken for the generator to start vaporising fuel as well as any flare ups. I recently pulled out my old gas lantern, cleaned it off, fitted a new mantle and lit it to burn off the remaining gas in the bottle before disposing of the old gas cyclinder. I then lit my new Coleman dual fuel lantern for a comparison. The photo below was taken at night with no flash. Notice the difference in shadows? 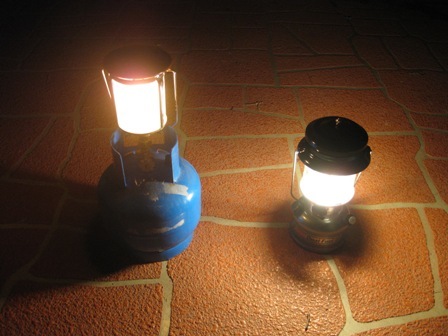 The dual fuel lantern throws a strong shadow off the gas lantern, indicating clearly that it is a far brighter light! I am very happy with the performance of my Coleman two-mantle dual-fuel lantern, the fuel convenience and ease of use. I still need to replace a few other flood-damaged pieces of my camping kit before we can go camping again, and a dual-fuel stove is on the list. Update: I have now purchased a Coleman Powerhouse 414 dual fuel stove and a second Coleman Premium two-mantle, dual-fuel lantern (model 285) . Alright this was ages ago so I don’t know if you will reply. Interesting to read, I am wanting to use a lantern inside the house as a means of warmth and light when the power goes out here in VIC, I am wanting a fuel that is safe to use inside. I understand Methylated spirits is such a fuel, do you know if you can run metho in these lanterns? No, you can’t. Unleaded fuel works fine, Coleman fuel may be cleaner, but much more expensive. Or you can use Panel Wipe (obtained from motor factors) which is clean and cheap. Any fuel burnt indoors will produce a CO risk, but I have used my lantern in tents with an open vent and I’m still here. Wouldn’t recommend leaving it on while you sleep though! Methylated spirits does not work in these lanterns. Anything that burns inside creates a carbon dioxide risk and is not recommended, including using these lanterns inside. Having said that, I have used my lanterns inside during power outages. I have ended up having half the neighbourhood at my house during blackouts because we were the only ones with decent light! I have been careful to leave doors and windows wide open to provide ventilation. I can do this in a Queensland summer, but you might find it too cold in a Victorian winter! Fuel lantern or an LED one like roadeavour?